Patellofemoral pain is a generic term for a variety of conditions that cause pain along the front of the knee. In the past, doctors referred to these symptoms as chondromalacia. Specifically chondromalacia refers to softening or injury to the cartilage underneath the kneecap. Patellofemoral pain refers to pain coming from the kneecap or front of the femur. There are a number of underlying causes for patellofemoral pain, including instability of the patella, malalignment of the lower extremities, weakness of the muscles of the hip or quadriceps, tightness of the lateral retinaculum (tissue on the outside of the kneecap), and overuse of the knee with certain sports and activities. Can surgery help patellofemoral pain? Typically an athlete with patellofemoral pain denies having a specific injury that initiates the symptoms. He or she will complain of pain along the front of the knee that has increased over time. Often the pain will be worse with activities, such as running or jumping. Often the pain increases to the point that he or she experiences it at rest. Patients often give two classic complaints with patellofemoral pain. They will often note difficulty going up and down stairs, especially going down stairs. They will also notice pain sitting with the knee bent for long periods of time, such as in a movie theater, on an airplane, etc. He or she will feel that he needs to stand up and straighten the knee out to relieve the pain. Other complaints include pain with deep squatting and pain standing for long periods of time. Usually patients do not notice significant swelling of the knee or symptoms such as locking, catching, or giving way. The pain felt by athletes with patellofemoral pain is usually diffuse, all around the front of the knee (white circle). If the pain is limiting an athlete’s ability to do what he or she would like to do, evaluation by a sports medicine physician can be very helpful. Physical examination can not only help to diagnose pain but also reveal underlying issues that can contribute to the symptoms, such as the patellar instability or maltracking, muscle weakness, alignment of the knees, and tightness of the lateral retinaculum. X-rays are usually negative, although they are important especially to determine if one patella tilts more toward the outside of the knee than the other. Also degenerative changes between the patella and the femur can be visualized on x-rays. MRI’s are rarely needed initially, as often there are no underlying structural abnormalities. Fortunately treatment is almost always nonsurgical, and its surgery is almost never the first option. Rehabilitation is almost always a good first option. Working with a sports physical therapist can help the athlete determine the underlying cause of the pain and work aggressively to get rid of it while getting back to sports. Occasionally taping or bracing the knee can be helpful, and occasionally shoe orthotics might be recommended, again depending on the underlying problem. There are rare instances where nonsurgical treatment fails to improve the symptoms. 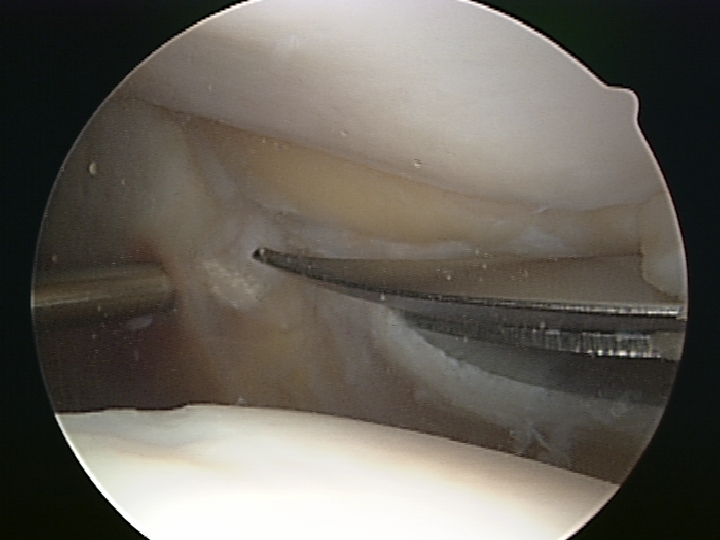 In these cases, surgery such as a lateral release or patella realignment surgery might be indicated. Usually these surgeries are performed after the patient has failed many months of physical therapy, bracing, and other nonsurgical treatments.